All prices shown on this site are in Australian Dollars. Click here to convert prices to other currencies. Where are the bikinis made? KL Swimwear is proudly Australian, all our swimwear are hand made locally on the East Coast of Australia. Orders are dispatched from our Head Office located at Banora Point, NSW. In most cases we will have your order ready to ship within 24-48 hours if its in stock or 2- 5 business days for back orders to be made and processed. We will notify you right away should we expect any further delays. If you are in a rush please contact us and we will give to an exact time we can have it ready to post to you. Will I have to Pay International Tax and Duty? International Orders may be subject to import duties and taxes, which are levied once a shipment reaches your country. The amount may vary depending on the country to which the order was shipped to. Customs policies vary widely from country to country; please contact your local customs office for further information. Note, in rare occasions custom agents may delay delivery of some packages. If you refuse a shipment from Kristen Lonie Swimwear, you are responsible for the original shipping charges, any import fees, duties and/or taxes that are incurred on the package, and the cost of returning the package to Kristen Lonie Swimwear. If you are not a resident of a country you are visiting and wanting to purchase our products, please check the rules and regulations with Customs for that country to ensure there is no issue with you receiving packages. Can I special order a colour or print Ive seen on Instagram but can not find it in the store? 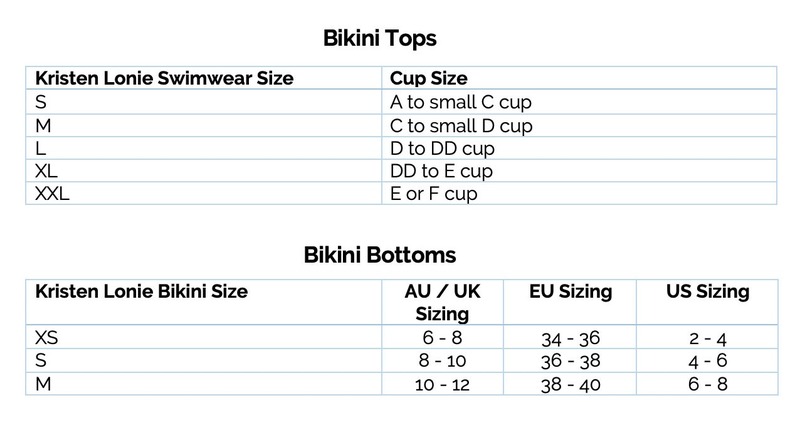 Send us a pic of the bikini you like the look of and we will check to see if we have any of that fabric left. Quite often we may have just a small amount left and would be more than happy to make one more if we can. How long does it take to receive a back order? We work around the clock to ensure all back orders made and processed as quickly as possible. Generally orders are dispatched within 1-3 business days. Allow up to 5 business days for back orders to be dispatched. We will notify you right away if there is going to be any delay. All orders received after 5pm on the 26th December 2018 will be processed in the first week of January 2019 when our head office reopens.